This Premium Cotton Accessory Box is the perfect tabletop accessory for cotton balls, swabs and rounds. 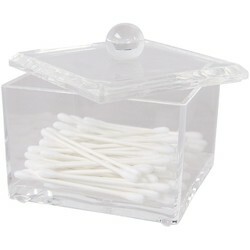 Can also be used for any accessory product that needs decorative and covered storage. Made of heavy clear acrylic. 4"W x 3.25"H.